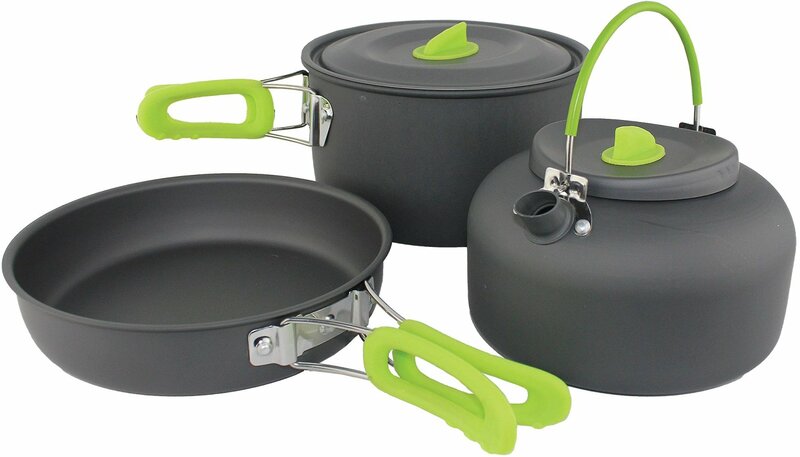 REVIEW: Yellowstone camp cooking set – Do your dream! All product reviews click HERE For our new campervan, we needed a new cooking set for pans, kettle and pots. But, being a tiny van, we needed tiny cooking set or a set that packs down small. So we needed to go for a camping set rather than a home set so that the handles and the like can fold down and get out of the way. We bought the Yellowstone set, and actually bought 2x different sets just to get 2x different sized pots¬ Spag Bol needs two pots…! The sets are well made, stack inside themselves, and are really pretty good. the kettle is perfect for 2 people and the pans are of good size – possibly too big. they are non stick and very light. They do seem to mark a bit when you fry something in them and this makes them look dirty, so that’s their only downside. So for a tiny campervan or tent they are really good. For a motorhome where space isn’t critical, I’d recommend not getting these. Wilkinson cheap pans did us well in our old van! also, look in Aldi/Lidle as they do their own version of these which are cheaper.